A Follow Spot: Aren't We All Ready for "The Architecture of Spring"? Aren't We All Ready for "The Architecture of Spring"? Poet Kathleen Kirk and other readers, including Candace Armstrong, Christopher Brandt, Jennie King, Peg Kirk, Ginny Nappi and Janice Witherspoon Neuleib, are offering "The Architecture of Spring," a poetry reading tomorrow night at the McLean County Museum of History. This free poetry reading celebrates the Museum's current exhibit called "The Architectural Legacy of A. L. Pillsbury," and it will include poems about Pillsbury's buildings, in terms of their architecture and other details, and the structures made by nature as well as humans. Not only is this special event free, but on Tuesday night, the museum and its exhibits are also free! 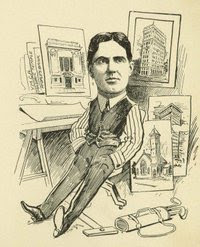 That's Mr. Pillsbury you see at the top of this blog in a caricature originally created for the Bloomington Pantagraph in about 1914, The Pantagraph tells us that Pillsbury's picture was part of "a series of similar sketches of prominent area residents." Pillsbury was born in Bloomington in 1869, and he spent his youth in Bloomington-Normal, the son of the principal at Illinois State University's Model School. He got an engineering degree from Harvard, and then returned to Illinois to study architecture at the University of Illinois, where he also played on the football team. And then he came back to Bloomington-Normal to ply his trade as an architect, helping rebuild downtown Bloomington after a disastrous fire in 1900 took out most of it, and becoming the premiere "society" architect in town, designing many beautiful homes that still grace our streets as well as schools, banks, barns and businesses. You can read a lot more about him and the many buildings he designed here, in an article prepared by the Museum. "The Architecture of Spring: A Poetry Reading," takes place Tuesday, March 29th from 7:30 pm to 8:30 pm at the McLean County Museum of History, 200 North Main Street in Bloomington. For more information about the Pillsbury exhibit at the Museum of History, click here. Thanks, Julie! It's a wonderful exhibit, and we have poems about homes, schools, barns, and Pillsbury himself, and, as poets, we share his passion for details.